Cholera Vaccination Test Reached Targets In Haiti : Shots - Health News Almost 90 percent of the target population – half in Port-au-Prince and the other half in a remote rural area – got fully protected against cholera. The results defy the forecasts of skeptics who said in advance of the campaign that it would be lucky to protect 60 percent of the target populations. 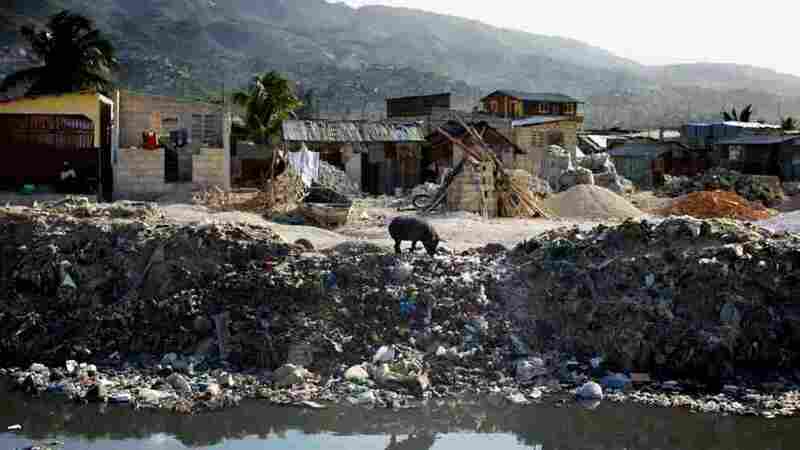 A lone pig roots through trash dumped over the side of a sewage canal that runs from the center of Port au Prince through Cite de Dieu. During the rainy season, the canal overflows its banks and fills nearby houses with sewage, which can carry cholera. The results are in on this spring's high-visibility pilot project to vaccinate 100,000 Haitians against cholera. Almost 90 percent of the target population – half in Port-au-Prince and the other half in a remote rural area – got fully protected against cholera, meaning they got 2 doses of the oral vaccine. The results defy the forecasts of skeptics who said in advance of the campaign that it would be lucky to protect 60 percent of the target populations. The sponsors of the project — the nonprofit medical groups GHESKIO in Port-au-Prince and Partners in Health in rural Haiti — presented the results on Monday at a session with the country's health minister, Dr. Florence Guillaume. Officials of both groups say the results have changed the discussion about vaccination as a strategy to fight Haiti's ongoing cholera problem. The water-borne disease has struck about 560,000 people since October 2010 and killed 7,300. 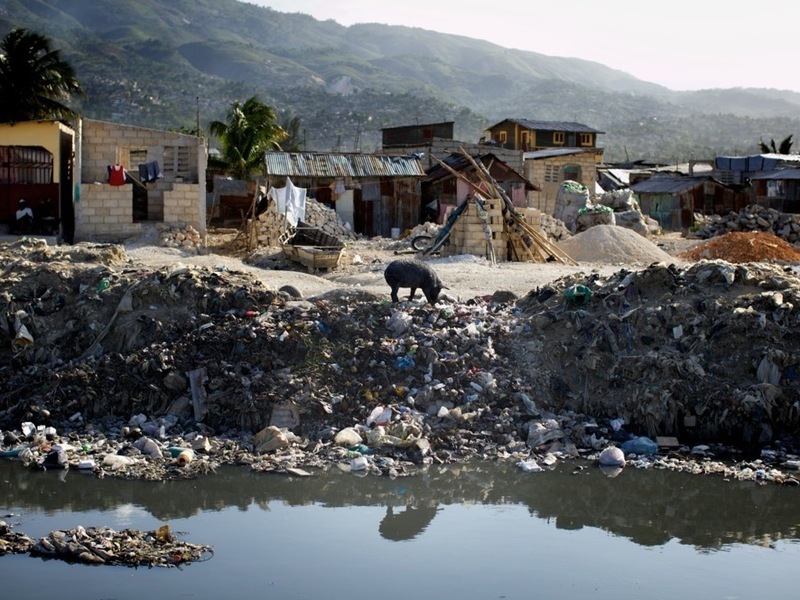 In the past, the Haitian government opposed cholera vaccination, saying resources should be devoted to treating cholera and improving water quality and sanitation. International groups such as the World Health Organization and the Pan American Health Organization have been skeptical of vaccination's role. "The debate has definitely shifted from whether we should scale up cholera vaccination to how we should scale it up," Jonathan Lascher of Partners in Health told Shots. "The health ministry wants vaccination integrated with the cholera strategy, and now the discussion is how to we do it." It's a much bigger project, since Haiti's population is about 10 million — 100 times the two pilot projects. "It's a big leap, but we had to do something first or nothing would have happened," Lascher says. GHESKIO's Dr. Jean William Pape, who also attended the session, confirmed Lascher's report. "The minister of health is convinced that, based on these results, at-risk populations should receive oral cholera vaccine as part of a global strategy," Pape writes in an email, along with improved sanitation and access to clean water. The pilot project took place from mid-April to mid-June. It involved two armies of community health workers who had earlier gone door-to-door in a huge Port-au-Prince slum and in tiny villages to sign up families and distribute vaccination cards to they could keep track of who had been vaccinated and who needed a second dose. Of those who got a first dose, 90 percent got the second. The vaccine protects for two to three years. Both groups report near-100 percent acceptance of the vaccine. The vaccination campaign was supposed to launch in early March so it could be completed before Haiti's rainy season, which floods the slums, makes rural roads impossible — and increases cholera transmission. But the projects were delayed six weeks by a report that the campaign was basically an experiment to test the vaccine rather than an attempt to see if it could be successfully delivered. A national ethics committee insisted on assurances that the vaccine wasn't experimental. The delay moved the vaccination project into the rainy season, requiring vaccinators to use canoes in some cases to get to rural villages. It also created a conflict with a long-planned national vaccination campaign against childhood diseases, including polio. Since cholera vaccine can't be given to children under 9 in close proximity to polio vaccine. That required the groups to defer cholera vaccination in these children, further complicating the logistics. But in the end, young children had an even higher rates of complete protection than the overall population – 94 percent. Partners in Health says the vaccine cost $2.13 a dose to buy and deliver, including a 2 percent wastage rate. That puts the price tag at about $175,000 to vaccinate 41,193 rural residents with two doses. One lucky break: This spring's spike in cholera cases was much lower than feared. For instance, Partners in Health treated 1,583 people for cholera this June compared to more than 14,000 a year ago. Still, this spring's outbreaks have added around 30,000 cases and 250 deaths to the epidemic's toll. As Haitians now begin to plan how to ramp up cholera vaccination, its allies are plotting how to raise the millions of dollars it would take. That effort may be abetted by the recent spread of cholera beyond the island of Hispaniola, which Haiti shares with the Dominican Republic, to nearby Cuba. A cholera outbreak this month in southeastern Cubahas so far affected about 170 people and killed at least three – the first time cholera has been reported on that island since it was a colony of Spain in the 1800s. No one knows how cholera got to Cuba. But one guess has to do with the several hundred Cuban medical personnel who staff clinics in Haiti, which is 109 miles southeast off the tip of Cuba.